The recurrent nova T Coronae Borealis last made a splash just after World War II. Does its current restive state hint at an imminent outburst? We’ve been struggling lately in northern Minnesota to get past winter and get on track with spring. That’s why I was so surprised to step out my door the other night and hear the frogs in full, throaty chorus. Variable stars can be like that, too. You can watch a particular variable for months, even years, and its brightness might fluctuate by a few tenths of a magnitude. Then all of a sudden, it blows up like a firecracker when you least expect. Take T Coronae Borealis (T CrB). It’s one of only about 10 stars in the entire sky classified as a recurrent nova, with two recorded outbursts to its name. Normally, the star slumbers at 10th magnitude, but on May 12, 1866, it hit the roof, reaching magnitude +2.0 and outshining every star in Corona Borealis before quickly fading back to obscurity. Eighty years later, on February 9, 1946, it sprang back to life, topping out at magnitude +3.0. 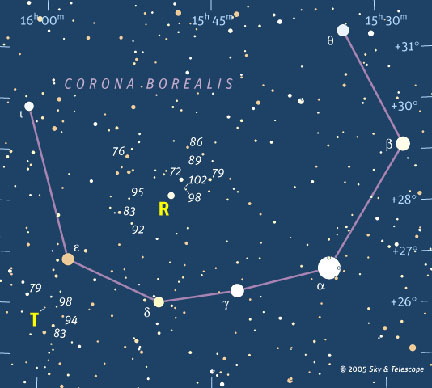 Many variable star observers include it in their nightly runs because it’s easy to find 1° south-southeast of Epsilon (ε) in Corona Borealis and only requires a 3-inch telescope. Not to mention the huge payoff should you happen catch the star during one of its rare explosions. Famed comet hunter and variable lover Leslie Peltier faithfully kept an eye on T CrB for over 25 years, hoping to catch it in outburst. On that fateful February morning in 1946 he’d set his alarm clock for 2:30 a.m., planning to check in on several favorite stars before dawn. But when he awoke and looked out the window, he felt a cold coming on and allowed himself instead to go back to bed. Big mistake. That very morning, T CrB came back to life. T stayed under the radar for the next 69 years, holding steady around magnitude +10.2–10.3. That began to change in February 2015, when it inched up to +10.0 and remained there until early February this year. That’s when things kicked into high gear with the star steadily growing brighter from late winter through early spring to reach its current magnitude of ~9.2. Alongside the brightening trend, T’s become bluer as well. 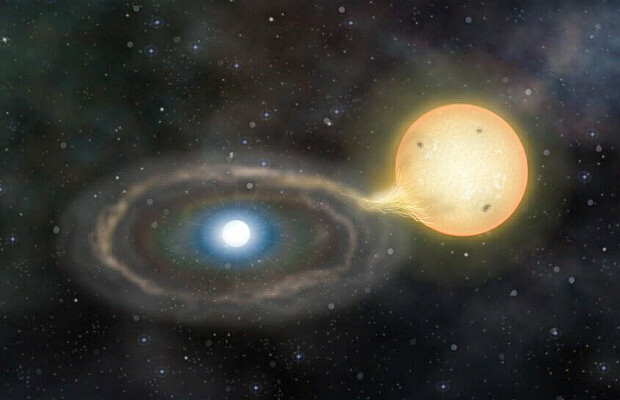 Astronomers describe its recent unprecedented activity as a star entering a “super active” state. This last happened in 1938, eight years before its last great outburst. T CrB followers can’t help but wonder if the next night we look up, Corona Borealis will twinkle with “new” second-magnitude star. Stars like T CrB involve a red giant closely paired with a white dwarf. 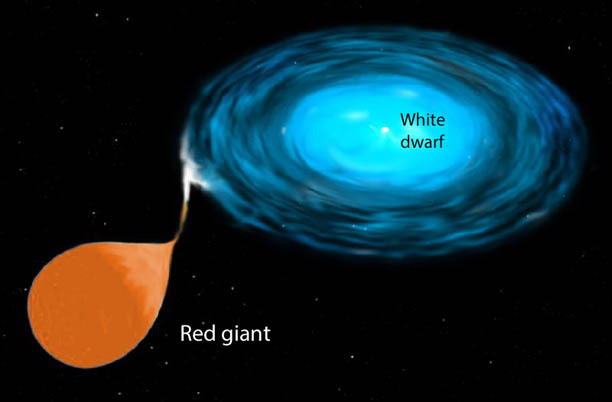 The giant feeds hydrogen gas into a swirling accretion disk around a massive, compact white dwarf at a rate a million times greater than the solar wind. Material funnels from the disk onto the dwarf’s surface until it ignites in a thermonuclear explosion similar to a nova. NASA. Recurrent novae are similar to nova and dwarf nova types but with unique characteristics that set them apart. All three types occur in close binary stars and involve mass transfer from a normal star to a small but gravitationally powerful white dwarf. Classical novae have only been seen in outburst once and typically brighten by 8-15 magnitudes before slowly fading back to their pre-outburst brightness. Dwarf novae outburst frequently — every 10-1,000 days — with moderate increases of 2-6 magnitudes. Recurrent novae fall in between and typically vary by 4-9 magnitudes over a 10-100 year period. T CrB has two components: a red giant star in a close, 227-day orbit with a planet-sized white dwarf. Material spills from the giant and accumulates in an accretion disk around the dwarf. Some of that gas gets funneled down to the dwarf’s surface, becomes compacted and heated, and eventually ignites in a spectacular thermonuclear explosion. We see the results as a sudden brightening of the star. It’s even theoretically possible for enough matter to accumulate on the dwarf to push it past the 1.4 solar mass Chandrasekhar Limit, forcing the entire star to burn explosively as a Type Ia supernova. At T CrB’s 2,500 light-year distance, it would easily cast shadows! Maybe we’ll have to wait until 2026 (80 years after the 1946 eruption) for T’s next upheaval. Or maybe not. Either way, let Leslie Peltier’s story serve as a cautionary tale. Keep a close eye on this star every clear night, and expect surprises. The physics and astronomy world is agossip with a rumor: has LIGO heard its first black-hole merger? Rumors are swarming on social media that the newly upgraded LIGO, the Advanced Laser Interferometer Gravitational-Wave Observatory or aLIGO, has finally seen the gravitational-wave signature of two stellar-mass black holes spiraling together and merging. Maybe even two such events since September. Or not. Such an observation would not only confirm one of the most elusive predictions of [Albert] Einstein’s general theory of relativity, it would open a new field of cosmic observation: gravitational-wave astronomy. First, the background: According to general relativity, any accelerating mass should produce weak ripples in the fabric of spacetime itself. But it would take enormous, dense masses accelerating extremely fast to emit a significant amount of them. Neutron stars or black holes spiraling together and merging would qualify, and LIGO was built with those events particularly in mind. Simulation of gravitational lensing by a black hole, which distorts the image of a galaxy in the background. As gravitational waves pass by, they stress and compress time and distance. But after travelling millions of light-years across the universe, they would be extremely weak. The typical expected signal strength would stretch and squeeze the distance from the Earth to the Sun, for instance, by the width of a hydrogen atom. Yet even that weak an effect could be detected by the laser beams bouncing back and forth along LIGO’s 4-kilometer vacuum pipes. It would be the first direct detection of gravitational radiation. (We already know it exists by its indirect effect of draining orbital energy away from close neutron-star binaries.) A Nobel Prize probably awaits the first direct observation. If it ever happens. 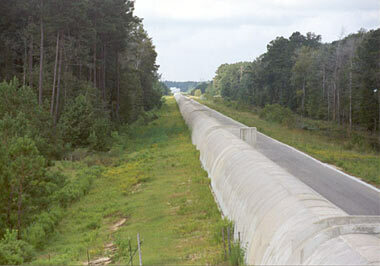 The tunnel for one of the LIGO arms in Livingston, Louisiana. Having two units nearly 2,000 miles apart provides essential error checking and would help triangulate to find the incoming direction of any gravitational waves. 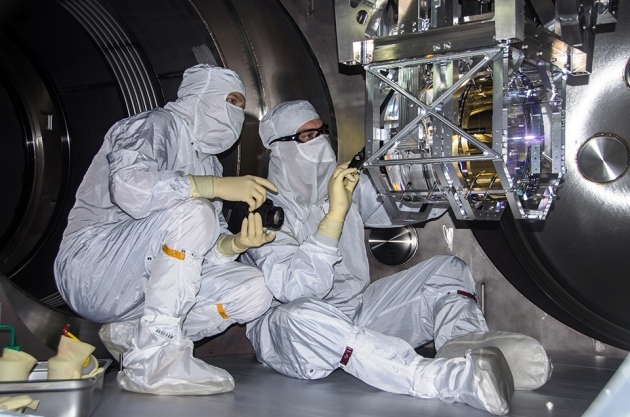 A third detector in Italy, named VIRGO, is scheduled to join the network. Such a feat “will open up a new window into the way we see the universe,” says astronomer Tanaka Takamitsu (Stonybrook University). Take gamma-ray bursts, for instance. These are quick, incredibly powerful explosions that are presumed to come, in some cases, from a pair of neutron stars spiraling together and merging, and in other cases from the fraction-of-a-second disruption of a dying star’s neutron-star-like core. Both kinds of cataclysm should be violent enough to send detectable gravitational waves far across the universe. “If we could see such events from gravitational-wave and conventional telescopes [both], then we can learn a lot more about the physics and what’s really going on with those events,” says Takamitsu. Still, the rumors remain just rumors. And they’re really bothering the LIGO people. The gossip started spreading in physics circles just a week after the upgraded aLIGO began running in September. The rumors escaped from physics circles when cosmologist Lawrence Krauss (Arizona State University) tweeted about them on September 25th: “Rumor of a gravitational wave detection at LIGO detector. Amazing if true. Will post details if it survives.” More recently he commented that he’s 60% sure the story will pan out. Yesterday he noted the caveat that he is not one of the 900-plus members of the LIGO scientific collaboration, nor does he represent anyone there. The meeting of the arms. The light pipes and the equipment in their ends (seen here) are kept in an ultrahigh vacuum. Second, it’s a small community. So when a few collaborators — who all happen to be members of LIGO — duck out of a future conference due to new overlapping commitments, it doesn’t go unnoticed. A similar pattern played out right before physicists announced the discovery of the Higgs boson. Based on dates cancelled, Sigurdsson speculates that an announcement will come from the team on February 11th. Takamitsu, however, speculates that it will take months. Details of the supposed detection, however, were not publicly bandied about until Monday, when theoretical physicist Luboš Motl posted on his blog the latest version of the rumor: that aLIGO has picked up waves produced by two colliding black holes each with 10 or more solar masses. He also said he’s been told that two events have been detected. There’s a good reason why LIGO’s people refuse to confirm or deny that something is going on. Scientists really want to get things right before they announce a major finding to the world, whether positive or negative. LIGO’s data-analysis task alone is vast and full of potential gotchas, and the most likely gravitational-wave detections would be buried deep in the noise. The experiment is looking for changes in the distance between mirrored blocks of metal 4 km apart as slight as 10–22 meter, about a millionth the diameter of a proton. In other words, changes in measurement of 1 part in 1025. What could possibly go wrong? Fresh on the minds of everyone in astronomy and physics is an announcement fiasco that blew up spectacularly in 2014. The astronomers of the Harvard-based BICEP2 collaboration announced to the world’s media, at a packed press conference, that they had very likely discovered primordial gravitational waves from the earliest instant of the Big Bang. The signal was unexpectedly strong. It would have been the much-sought, crowning evidence for the inflationary-universe theory of how the Big Bang happened. Not until later did their work go through full peer review. The discovery literally turned to dust — leaving a very public mess and a lot of criticism. Many dread a repeat. The current excitement could easily be a false alarm. Even if LIGO has a promising signal, it may be a false test signal planted as a drill. It’s been done before, in 2010 near the end of LIGO’s last pre-upgrade run. Three members of the LIGO team are empowered to move the mirrored blocks by just the right traces in just the right way. Only they know the truth, and the test protocol is that they not reveal a planted signal until the collaboration has finished analyzing it and is ready to publish a paper and hold a press conference. “Blind tests” like this are the gold standard in all branches of science. So we’ll just have to cool our heels. But maybe not for long. If the detection is real, it’s likely to be announced in February or March according to various reports. If it was just a test, this will presumably be announced in a similar time frame. 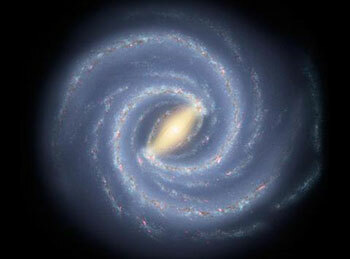 An artist’s impression of what Milky Way, and especially its peanut-shaped bulge, would look like from the outside. Astronomers root their response in a mathematical function that describes how many stars exist at any given mass, known as the initial mass function. In general, we know there are many more low-mass stars than high-mass ones, just as you’ll find far more fine grains of sand than large pebbles on a beach. And just as knowing exactly how many more fine grains there are than pebbles will tell you something about how that beach came to be, stars’ initial mass function helps astronomers investigate everything from the details of star formation to the mass of the Milky Way and other galaxies. 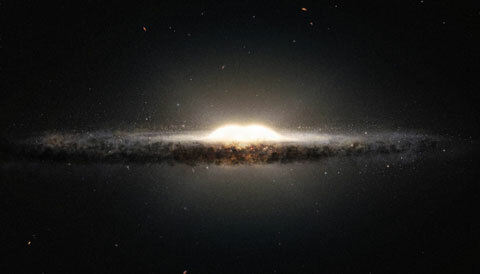 Until now, astronomers’ best measurements of the initial mass function have been limited to relatively nearby stars, which lie within the Milky Way’s pancake-shaped disk. But other galaxies have shown tantalizing hints that the mass distribution of stars might differ from place to place within a galaxy. Now, a recent study has applied the power of the Hubble Space Telescope to go beyond the disk and count stars within the Milky Way’s bulge, the sardine-packed collection of stars far away in the center of our galaxy. A team led by Annalisa Calamida (Space Telescope Science Institute) reported the initial mass function for low-mass bulge stars in the September 1st Astrophysical Journal, focusing stars less massive than the Sun. The astronomers tracked stars’ proper motions across the sky using the exquisitely sharp Hubble images, then picked out the background bulge stars by their odd, boxy orbits. The result is a sample of low-mass stars with near-zero “contamination” from nearby stars. Overall, the team’s results aren’t surprising: they estimate an initial mass function that roughly agrees with previous measurements, including one made by this author. But there are hints of something interesting afoot: the new results suggest that the bulge might contain relatively fewer very low-mass stars. More work is needed to test whether this result pans out, but if it’s real, the difference would suggest a difference in how stars form in the galactic bulge compared to the disk. This study is an important first step in going beyond the nearby disk stars that are often observed. 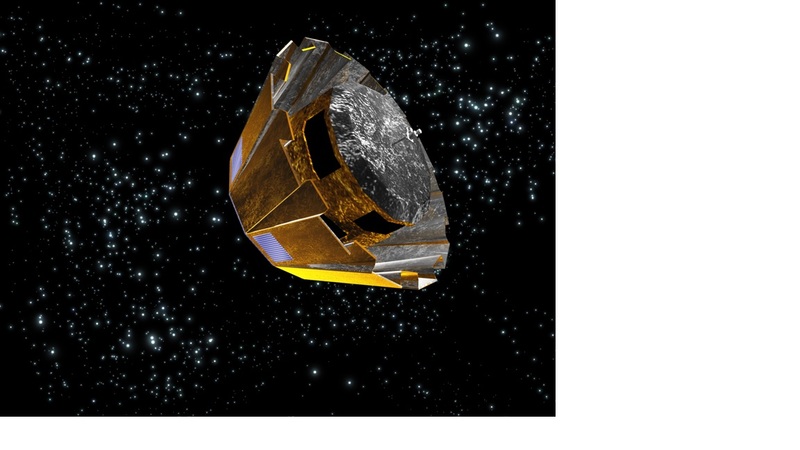 And there’s more to come: with the Gaia mission already at work surveying more than 1 billion stars and the Large Synoptic Survey Telescope on the way, astronomers will soon be counting stars throughout our galaxy. And the initial mass functions they measure will tell us not only how many stars are out there, but how star formation varies from place to place in our galaxy. 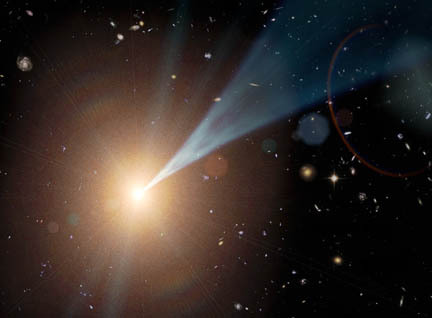 Observing a blazar is a little like standing beneath a relativistic waterfall. Look up: that flickering point of light is a head-on view of the powerful plasma jet shooting out from a supermassive black hole. The free-flying electrons within that mess of plasma twirl at almost light speed around magnetic fields, and they radiate across the electromagnetic spectrum, often drowning out any other forms of emission. We might even see a sudden outburst when turbulence, a sudden influx of plasma, or some other force roils the jet. But when Markus Ackermann (DESY, Germany) and colleagues pored through almost seven years of data collected with the Fermi Gamma-Ray Space Telescope, they saw something completely unexpected: a regular signal coming from a blazar. Gamma rays from PG 1553+113 seem to brighten roughly every 2.2 years, with three complete cycles captured so far. Moreover, other wavelengths seem to echo this cycle. Inspired by the gamma-ray find, Ackermann’s team sought out radio and optical measurements from blazar-monitoring campaigns — and both wavelengths show hints of the same periodic signal. 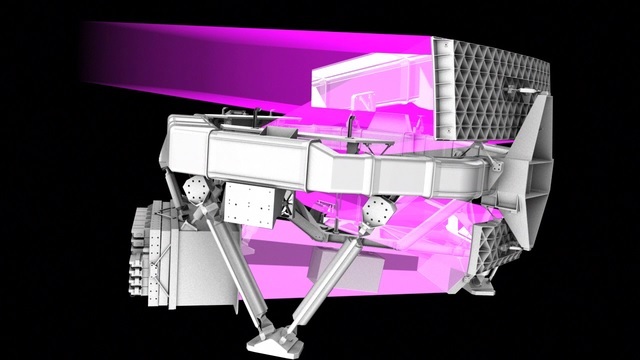 The team also looked at X-ray data collected over the years by the Swift and Rossi X-ray Timing Explorer spacecraft, but there weren’t enough data points for a proper analysis. 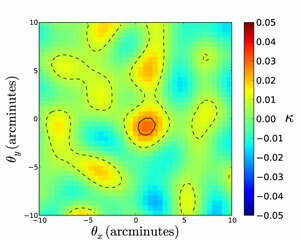 The results are published in the November 10th Astrophysical Journal Letters. (Click here for full text). If this signal is real, it has to come from the black hole-powered jet, and the authors explore a number of explanations. For example, the jet might be precessing or rotating, sweeping its beam past Earth every 2 years or so. Or perhaps a strong magnetic field chokes the flow of gas toward the black hole, creating instabilities that then regularly flood the jet with material. The most intriguing prospect is another supermassive black hole in the system, its presence affecting gas flow and jet alignment. At this point, though, the authors admit they don’t have enough data to distinguish between these possibilities. Further monitoring might remedy that. “I am always skeptical about claims of periodicity based on only 2 to 3 cycles,” says Alan Marscher (Boston University), a blazar expert not involved in the study. Even completely random processes, he adds, can create apparently regular signals over short periods of time. And Ackermann’s team is frank about the data’s limits. After all, blazars are known to flare randomly and, due to the length of the suspected cycle, only three complete periods have been captured so far. The authors estimate a few percent probability that this signal is indeed a chance alignment of random flares. Still, the fact that the signal is observed across radio, optical, and gamma rays strengthens the case. “Seeing such well-correlated oscillations across the different wavebands isn’t as common as simple models would expect,” Marscher notes. A collaboration of amateur and professional astronomers has uncovered a rare variety of eclipsing binaries. The European Space Agency’s Gaia satellite first imaged the eclipsing pair, named Gaia14aae, in August 2014. Researchers took notice of Gaia14aae when it suddenly flared five-fold within a single day. The Gaia14aae system is composed of a white dwarf in a tight orbital embrace with a larger (by volume) companion. The tilt of orbit is along our line of sight, so observers on and near Earth — such as the Gaia mission in space — see an eclipse of the pair once every 50 minutes. A worldwide pro-am collaboration carried out follow-up observations of Gaia14aae, cinching its nature as an eclipsing binary star. This effort included the Centre for Backyard Astrophysics (CBA), a group of amateurs who monitor cataclysmic variables using small telescopes in backyards around the world. 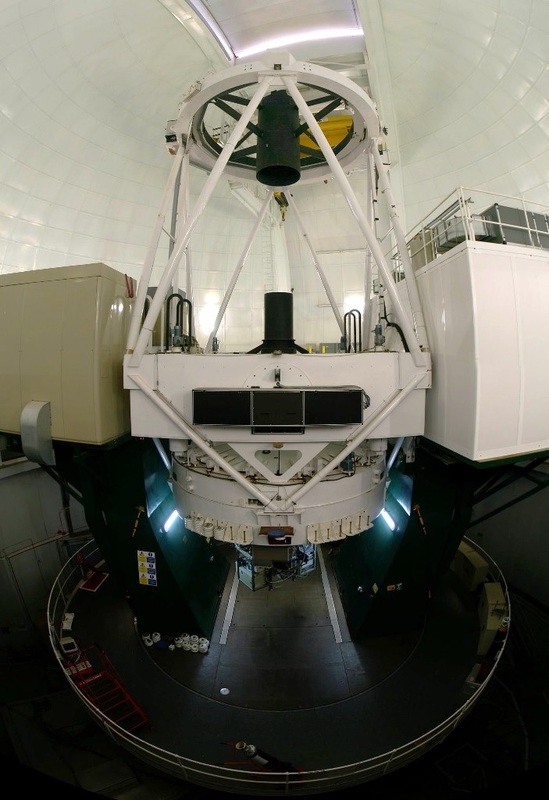 CBA members kept eyes on the system after Gaia’s initial sighting of its outburst, as did a collaboration of 86 professionals based at facilities including the Catalina Real-time Transient Survey, PanSTARRS-1, and ASAS-SN based in Chile and Hawaii. This movie shows 30-second exposures from the Loiano Observatory over a span of 88 minutes (sped up by a factor of 250), revealing two eclipses of the Gaia14aae system. Gaia14aae is located 730 light-years from Earth in the constellation Draco. The ‘Gaia14aae’ designation denotes the discovery year (2014) followed by the sequence, with ‘aaa’ being the first object of interest discovered in that particular year. 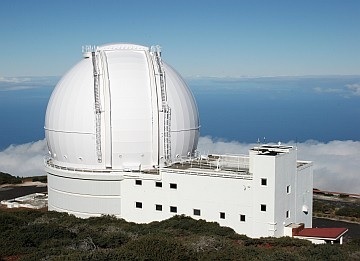 Astronomers conducted spectroscopic analysis of the system using the William Herschel Telescope in the Canary Islands. 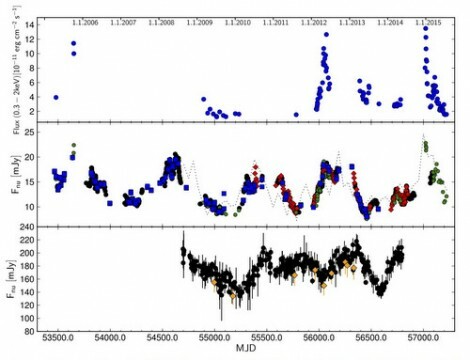 They found that Gaia14aae is in fact a rare type of binary system that varies dramatically in brightness over short periods of time, known as an AM Canum Venaticorum (AM CVn) cataclysmic variable. This type is characterized by the absence of hydrogen and the abundance of helium in its spectrum. Forty other such binary systems are known, but this one’s an eclipsing binary, each star passing in front of and blocking the light of its partner in turn. Eclipsing binaries are valuable because they reveal a key ingredient, the tilt of the system’s orbit — it has to be edge-on for the stars to eclipse each other. Knowing that one fact makes calculating other properties, like the mass of the two stars and the distance between them, easy. The discovery is important to researchers studying Type 1a supernovae, the apocalyptic explosions of white dwarfs that eat too much and whose detonations shine with a characteristic brightness. These “standard candles” are crucial for measuring extragalactic distances and serve as a cornerstone for the discovery of the acceleration of the expansion of the universe due to dark energy. Here, we’re seeing the anatomy of a probable Type 1a supernova in the making: a star 125 times the volume of our Sun locked in a death spiral with a white dwarf 100 times more massive than it. Researchers are unsure whether the two stars will collide in a dramatic supernova explosion, or if the white dwarf will devour its tenuous companion first. The eclipsing nature of the system gives researchers the unprecedented opportunity to measure the physical parameters of a Type 1a supernova before it occurs. A galactic supernova courtesy of Gaia14aae would be easily visible from Earth, though such a spectacle is probably still thousands of years in the future. Fraser adds that the masses are essential to testing theory. “This means we can start to understand how systems like Gaia14aae come about — and what it would have looked like billions of years ago when it formed,” he adds. 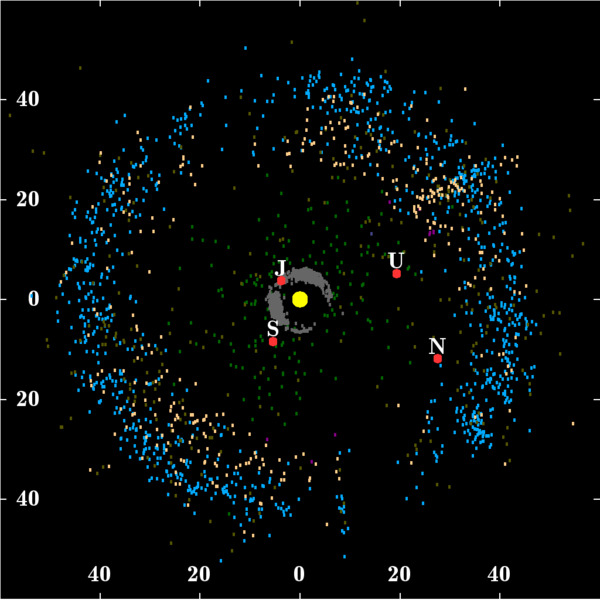 Objects of the Kuiper belt (blue). Plot displays the known positions of objects in the outer Solar System within 60 astronomical units (AU) from the Sun. Epoch as of January 1, 2015. 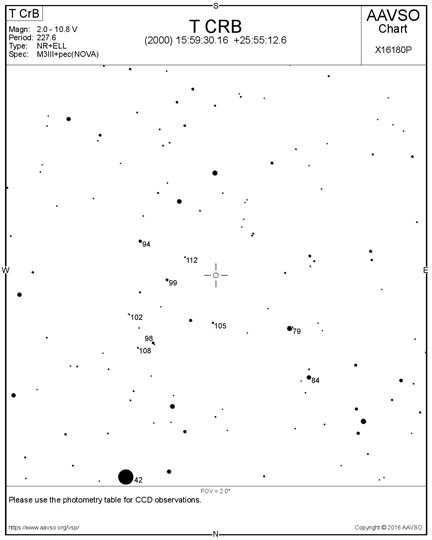 The discovery of Gaia14aae is a great example of amateur and professional astronomers working together, and a sign of more exciting discoveries to come down the road. 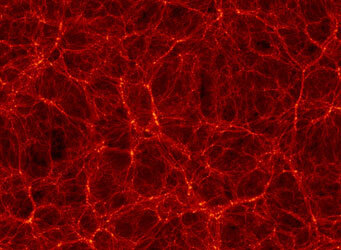 Two projects are mapping the distribution of dark matter in the universe, probing scales both large and small. Observations show the universe to be a cosmic spider web: galaxies and clusters of galaxies are strung along its nodes and filaments like so many caught flies. Yet the thread — dark matter, which makes up 85% of the universe’s mass — is largely invisible, fully visualized only in simulations. Scientists are finding ways to map this unseen backbone of the universe, plotting its effect on light coming from distant galaxies and even from the remnant glow of the Big Bang, the cosmic microwave background [CMB]. 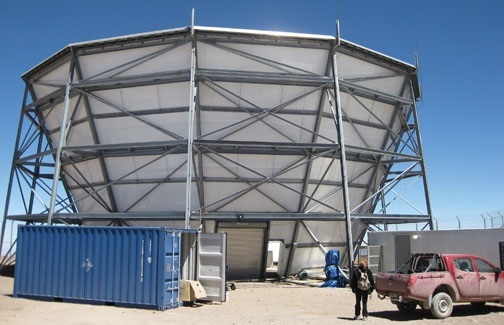 Two projects making the invisible visible are the Dark Energy Survey, led by Josh Frieman (Fermilab) and conducted at the Cerro Tololo Inter-American Observatory in the Chilean Andes, and the Atacama Cosmology Telescope [ACT] polarization survey, also in Chile and high in the Atacama Desert. These complementary surveys are taking on the universe on scales big and small. By measuring dark matter’s smearing effect on galaxy shapes, the Dark Energy Survey mapped out the mysterious stuff’s density over a 139-square-degree swath of sky. The color scale reflects dark matter density; grey circles mark galaxy clusters – bigger circles represent larger clusters. Using preliminary data that covers just 3% of the full survey, a team led by Vinu Vikram (Argonne National Laboratory) examined the shapes of more than 1 million faraway galaxies, whose light has traveled between 5.8 billion and 8.5 billion years to reach us. The team was looking for the smearing effect of intervening dark matter. Dark matter’s gravity acts like a lens to magnify and distort the galaxies’ light, but its effect is weak — individual galaxies vary enough in shape that the gravitational lensing isn’t noticeable. The key is quantity: measure enough galaxies and the smearing becomes plain. Vikram and colleagues measured the smearing to construct a two-dimensional dark matter map, plotting out how much dark matter lies along lines of sight within a 139-square-degree area. 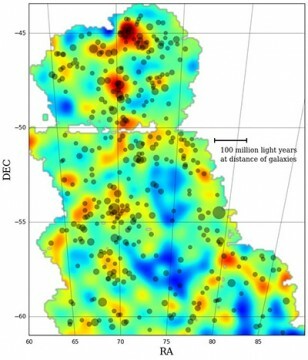 Since the map traces normal, luminous matter (galaxies and galaxy clusters) as well as the now-visible dark matter web, astronomers can use it to study the connection between the two. Galaxies and clusters don’t exactly trace the underlying dark matter distribution, since normal and dark matter follow different physical laws, so knowing how the two differ is essential for puzzling out longstanding mysteries. After viewing the grand, 500-million-light-year scales of the Dark Energy Survey results, which still only hint at the mammoth survey to come, zooming into recent observations from the Atacama Cosmology Telescope (ACT) is like taking a sip of the shrinking potion in Alice in Wonderland. The ACT dark matter maps focus on a scale of a mere 3 million light-years, roughly the size of a dark matter halo around an individual galaxy. Graduate student Mathew Madhavacheril and his advisor Neelima Sehgal (both Stony Brook University) led a team in measuring dark matter’s smearing effect, not on the light from faraway galaxies, but on the most well-traveled light in the universe: the cosmic microwave background (CMB). 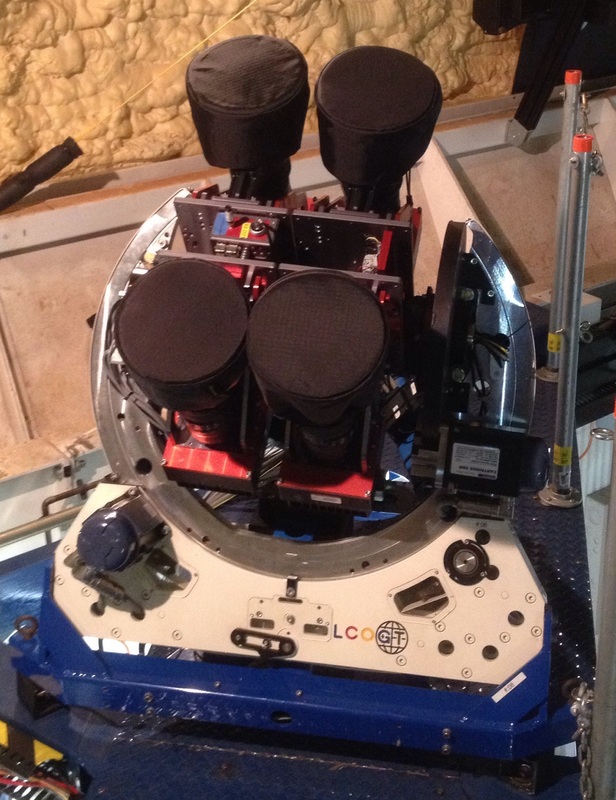 ACT’s polarimeter spent 3 months surveying the glow from photons freed 380,000 years after the Big Bang at a frequency of 146 GHz (corresponding to a wavelength of 2 millimeters). Even though this glow is “bumpy,” varying in brightness from one spot to the next, it’s actually pretty smooth on the arcminute scales probed by ACT. But a million-light-year-wide hunk of intervening dark matter will distort the light and create sharp changes in brightness on these small scales. The team looked for such brightness changes and found about 12,000 that matched up with galaxies listed in a Sloan Digital Sky Survey catalog. Each of these galaxies has a massive halo roughly 10 times that of the Milky Way. Stacking all the ACT images together, the team created an image of an average dark matter halo. Simply measuring the signal from galaxies’ dark matter halos is an accomplishment — little has been done on these small scales before. The average dark halo’s mass and concentration, as measured from this blobby image, so far match what’s expected from dark matter simulations. 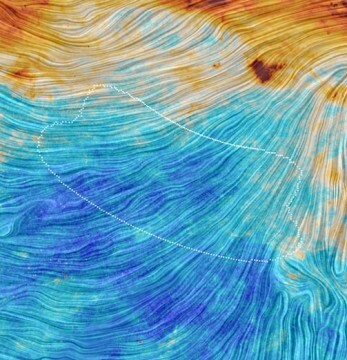 The same technique will be applied to the Advanced ACT polarization survey taking place between 2016 and 2018, which will cover ten times the sky area. Eventually, Madhavacheril hopes to trace the growth of dark matter halos over cosmic time. Preliminary as they are, these maps pave the way for understanding dark matter’s role in the universe, including its structure, its connection to ordinary matter, and its role in the evolution and fate of the universe. The nova that erupted in the Sagittarius Teapot on March 15th continues to brighten at a steady rate. As of the morning of March 22nd it’s about magnitude 4.3, plain as can be in binoculars before dawn, looking yellowish, and naked-eye in a moderately good sky. Update Sunday March 22: It’s still brightening — to about magnitude 4.3 this morning! That’s almost 2 magnitudes brighter than at its discovery a week ago. It’s now the brightest star inside the main body of the Sagittarius Teapot, and it continues to gain 0.3 magnitude per day. This seems to be the brightest nova in Sagittarius since at least 1898. And, Sagittarius is getting a little higher before dawn every morning. The nova is right on the midline of the Sagittarius Teapot. The horizon here is drawn for the beginning of astronomical twilight in mid-March for a viewer near 40° north latitude. The nova is about 15° above this horizon. Stars are plotted to magnitude 6.5. For a more detailed chart with comparison-star magnitudes, see the bottom of this page. 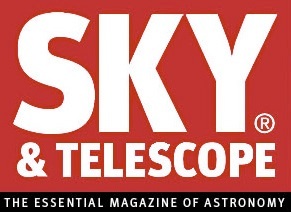 Sky & Telescope diagram. You never know. On Sunday March 15th, nova hunter John Seach of Chatsworth Island, NSW, Australia, found a new 6th-magnitude star shining in three search images taken by his DSLR patrol camera. The time of the photos was March 15.634 UT. One night earlier, the camera recorded nothing there to a limiting magnitude of 10.5. Before and after. Adriano Valvasori imaged the nova at March 16.71, using the iTelescope robotic telescope “T9” — a 0.32-m (12.5-inch) reflector in Australia. His shot is blinked here with a similarly deep earlier image. One of the tiny dots at the right spot might be the progenitor star. The frames are 1⁄3° wide. A spectrum taken a day after the discovery confirmed that this is a bright classical nova — a white dwarf whose thin surface layer underwent a hydrogen-fusion explosion — of the type rich in ionized iron. The spectrum showed emission lines from debris expanding at about 2,800 km per second. 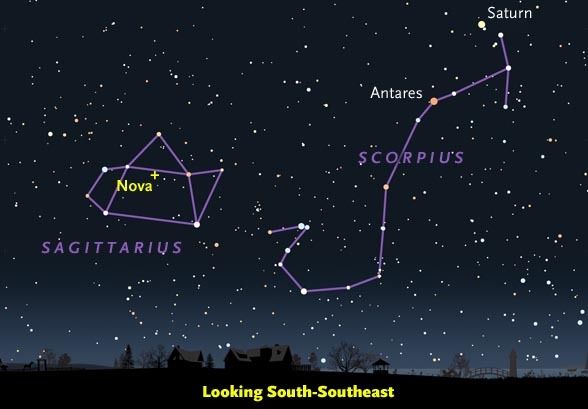 The nova has been named Nova Sagittarii 2015 No. 2, after receiving the preliminary designation PNV J18365700-2855420. 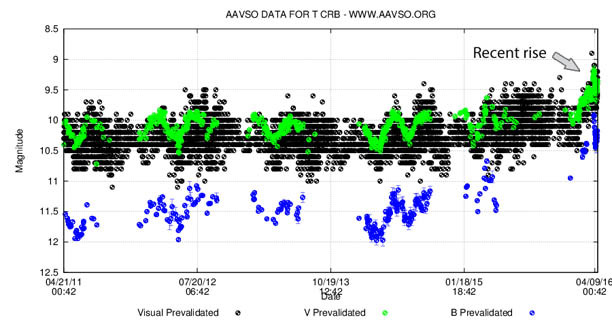 Here’s its up-to-date preliminary light curve from the American Association of Variable Star Observers (AAVSO). Here is the AAVSO’s list of recent observations. Although the nova is fairly far south (at declination –28° 55′ 40″, right ascension 18h 36m 56.8s), and although Sagittarius only recently emerged from the glow of sunrise, it’s still a good 15° above the horizon just before the beginning of dawn for observers near 40° north latitude. If you’re south of there it’ll be higher; if you’re north it’ll be lower. Binoculars are all you’ll need. It looks yellowish. Here’s a color image of its spectrum taken March 17th, by Jerome Jooste in South Africa using a Star Analyser spectrograph on an 8-inch reflector. Note the wide, bright emission lines. They’re flanked on their short-wavelength ends by blueshifted dark absorption lines: the classic P Cygni profile of a star with a thick, fast-expanding cooler shell or wind. Below is a comparison-star chart from the AAVSO. Stars’ visual magnitudes are given to the nearest tenth with the decimal points omitted. The cross at center is Nova Sagittarii 2015 No. 2. Magnitudes of comparison stars are given to the nearest tenth with the decimal points omitted. The frame is 15° wide, two or three times the width of a typical binocular’s field of view. Courtesy AAVSO. 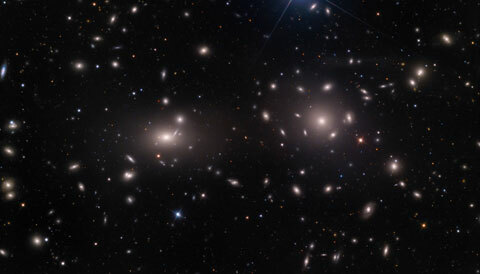 The Coma Cluster, visible in the evening skies of spring and summer, reveals its jewel box to large backyard telescopes: several thousand galaxies sardine-packed into a space only 20 million light-years across. But there’s more to the Coma Cluster than meets the eye — or the backyard telescope. Pieter van Dokkum (Yale University) and colleagues took a unique look at Coma through the Dragonfly Telephoto Array, eight Canon telephoto lenses coupled to CCD cameras. The Dragonfly is designed to find faint, fuzzy blobs, but what its images revealed surprised the team. On Coma’s outskirts lurk 47 galaxies similar in size to the Milky Way — but with 1,000 times fewer stars. 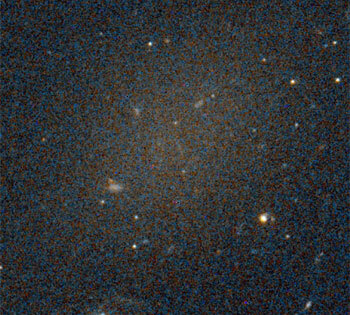 To survive in crowded Coma, these dark galaxies must contain 98% dark matter to hold themselves together, much higher than the fraction in the universe at large (83%). Hubble imaging picked up one of the dark galaxies serendipitously. The galaxy’s smattering of red stars is barely visible against the backdrop. The galaxies’ size depends on their distance, so to make sure this result wasn’t just a trick of perspective, van Dokkum and colleagues had to make sure these galaxies really belonged to the Coma cluster, more than 300 million light-years away. If they turned out to live nearby, the galaxies’ size would be akin to regular ol’ dwarf galaxies. Determining cluster membership was a challenge because the objects are far too faint to study in the usual ways, such as taking a spectrum to determine their distance. Nonetheless, “van Dokkum and his co-authors make quite a convincing case,” says Mark den Brok (University of Utah). The authors initially expected the galaxies to be distributed randomly, as they would be if they lay in the foreground near the Milky Way. Instead, the galaxies cluster around the center of the image in the cluster’s periphery. The discovery of a serendipitous Hubble image of one of the galaxies strengthened the team’s case, den Brok says, definitively showing that it doesn’t have the traits of a nearby dwarf galaxy. Somehow these weirdly faint galaxies have lost their stars — or they never had many stars in the first place. Van Dokkum and colleagues suggest that these may be “failed” galaxies, having forfeited most of their star-building gas after hosting a first generation of stars. Simulations that track the evolution of large-scale structure suggest that even normal galaxies start out with three times more star-building material than they develop into stars. So whatever process works to limit star formation in normal galaxies is working particularly well in these dark matter-rich galaxies. “I was actually very much relieved to see Prof. van Dokkum’s paper,” Stinson adds. Dark matter simulations have been producing galaxies with exactly the size and matter distribution that van Dokkum’s team observed, but such galaxies are naturally difficult to observe. It’s ironic that dark matter-rich galaxies were discovered in Coma, the birthplace of dark matter theory. Observations of the same cluster in 1933 helped Fritz Zwicky (Caltech) first conceive of the invisible matter that shapes the large-scale structure of the universe. Now ever-deeper observations continue to help astronomers understand dark matter’s role in galaxy evolution. 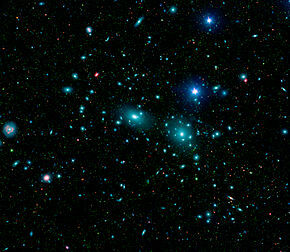 A Sloan Digital Sky Survey/Spitzer Space Telescope mosaic of the Coma Cluster in long-wavelength infrared (red), short-wavelength infrared (green), and visible light. The many faint green smudges are dwarf galaxies in the cluster. Meanwhile, The Telescope first appeared as a quarterly magazine in March 1931 under the editorship of Harlan Stetson, director of the Perkins Observatory in Ohio. It featured popular articles about contemporary research written by professional astronomers. In 1934 Stetson moved to Cambridge, Massachusetts, and brought the magazine with him. Publishing duties were assumed by the Harvard College Observatory (HCO), and The Telescope became bimonthly. The first issue of the merged Sky & Telescope came out in November 1941, just one month before the bombing of Pearl Harbor.